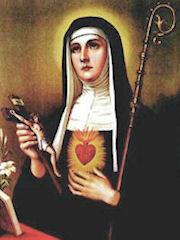 Saint Margaret Mary Alacoque lived a simple life, a life dedicated to God. She was a nun in Paray-Le-Monial in France. It was here that she had visions, these visions told her to spread the devotion to the Sacred Heart of Jesus. To this end, Saint Margaret Mary helped begin the feast day to the Sacred Heart we know today. She was a humble person, a prayerful person and a person who dedicated her life to serving God. As a school community we celebrate her feast day in October each year and continually follow her example as we strive to live, love and learn in the light and example of Christ. As a young man, Francis liked to have a good time. His father was rich. But once, when he was sick, Francis heard our Lord calling him to leave the world and follow Him. Francis began to visit the hospitals and to serve the sick. He used to say, "When one serves the poor, he serves Christ Himself." Francis put on the clothes of a poor shepherd and began to preach to the people about peace with God, peace with one's neighbour, and peace with one's self. He looked on all people and things as his brothers and sisters because they were all created by the same God. Francis took twelve young men to Rome with him, and the Pope gave him permission to start a new religious order, the Franciscans. 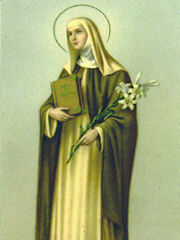 He also helped St. Clare to start the order known as the Poor Clares. Francis had a vision in which he saw Jesus hanging on the Cross. The marks of the five wounds of Jesus were left in his hands, his side, and his feet, which remained with him all his life. When Francis became very ill, he prayed, "O Lord, I thank You for the pains which I suffer." He died October 4 1226. 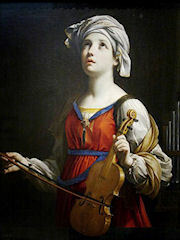 Cecilia was a Roman noblewoman who had given her heart to Christ. Under the rich clothes worn by women of high class, Cecilia wore a rough shirt that caused her suffering. She wanted to be able to offer this sacrifice to Jesus, whose bride she intended to be. But Cecilia's parents gave her in marriage to a young pagan noble, Valerian of Trastevere. Celia is considered the patroness of music because during the wedding celebration, the lovely bride sat apart, singing a hymn of love to God in her heart. When she and Valerian, her husband, were alone, she gathered up courage and said to him: "I have a secret to tell you. You must know that I have an angel of God watching over me. If you let me keep my promise to be Christ's bride only, my angel will love you as he loves me." Valerian was surprised and said kindly, "Show me this angel. If he comes from God, I will do as you wish." Cecilia said, "If you believe in the one true God and receive the waters of Baptism, then you will see my angel." Valerian went to Bishop Urban and was received with joy. After he had professed his belief in the Christian religion, he was baptized and returned to St. Cecilia. There by the saint's side, the young man saw the splendid angel. St. Joseph was the husband of Mary, the mother of Jesus. 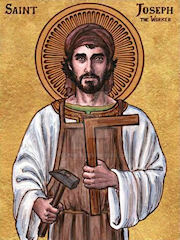 According to the earliest Christian traditions, he was a carpenter or woodworker. The Gospel of Matthew calls him a 'righteous man' meaning he was an observant Jew who obeyed God’s law. Joseph was engaged to Mary, but when he discovered that she was pregnant with Jesus, he decided to call off the marriage - but 'quietly' since the penalty for adultery was death by stoning. However, the angel of the Lord told him in a dream that he should go ahead with the marriage because Mary’s child was conceived by the Holy Spirit. This was the first of four divinely inspired dreams that are recorded in the Gospel of Matthew; for this reason, he is sometimes called 'the dreamer'. After each of these dreams, “he did as the angel of the Lord had commanded him” (Matthew 1:24). Teresa was born in Avila in Spain. As a little girl in her parents' rich home, Teresa and her brother Rodrigo loved to read the lives of the saints and martyrs. They felt that the martyrs got to heaven an easy way. The two children set out secretly to go to the land of the Moors. As they walked along, they prayed that they might die for Christ. But they had not gotten far when they met an uncle. He took them back to their worried mother at once. Next the children decided to be hermits in their garden. This didn't work out either. They could not get enough stones together to build their huts. St. Teresa herself wrote down these amusing stories of her childhood. But when she grew to be a teenager, however, she changed. Teresa read so many novels and foolish romances that she lost much of her love for prayer. She began to think more of dressing up to look pretty. But after she recovered from a bad illness, Teresa read a book about the great St. Jerome. Then and there, she made up her mind to become a bride of Christ. As a nun, Teresa often found it hard to pray. Besides that, she had poor health and also wasted time every day in long, foolish conversations. But one day, in front of a picture of Jesus, Teresa felt great sorrow that she did not love God more. She started then to live for Jesus alone, no matter what sacrifice had to be made. She learned to pray in a marvelous way, too. 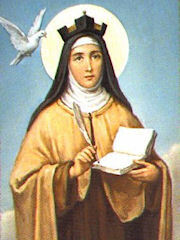 St. Teresa of Avila is famous for having opened new Carmelite convents. These convents were filled with sisters who wanted to live holy lives. St. Teresa was a great leader and true lover of Jesus and his Church. She died in 1582. St. Teresa taught that we must have a great trust in God's care for us. She wrote that a person who has God, will need nothing; God alone is enough. 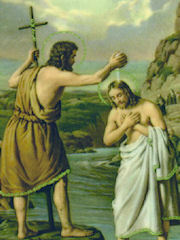 St. John the Baptist was a cousin of Jesus. His mother was St. Elizabeth and his father was Zechariah. The first chapter of Luke's Gospel tells of the wonderful event of John's birth. John preached a baptism of repentance, preparing people for the Messiah. He baptized Jesus in the Jordan River and watched with quiet joy as the Lord's public ministry began. John encouraged his own disciples to follow Jesus. He knew that Jesus' fame would grow, while his would fade away. In the first chapter of the Gospel of John, St. John the Baptist calls himself a voice crying in the desert to make straight the path of the Lord. He invited people to get ready, to prepare themselves to recognize the Messiah. His message is the same to each of us today. King Herod and his wife refused to obey God. They wanted to make their own rules for their lives. So St. John the Baptist told them what they were doing was wrong. Because he was honest and would not agree to do wrong, it made Herod's wife angry and she asked her husband for the head of John the Baptist. Yet John would have had it no other way. He would not remain silent while sin and injustice were happening. He asked people to be sorry for their sins, obey God and be His friend as true happiness comes only from God. Mark's Gospel, chapter 6:14-29, tells of the cruel death of John the Baptist. What suffering John agreed to bear for teaching the truth. 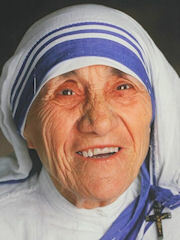 Mother Teresa was the founder of the Order of the Missionaries of Charity, a Roman Catholic congregation of women dedicated to helping the poor. Considered one of the greatest humanitarians of the 20th century, she was canonized as Saint Teresa of Calcutta in 2016. Born in 1910, in Skopje, Macedonia, Mother Teresa taught in India for 17 years before in 1946 she experienced her "call within a call" to devote herself to caring for the sick and poor. Her order established a hospice; centres for the blind, aged, and disabled; and a leper colony. In 1979 she received the Nobel Peace Prize for her humanitarian work. 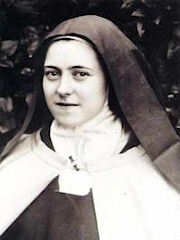 She died in September 1997 and was beatified in October 2003. In December 2015, Pope Francis recognized a second miracle attributed to Mother Teresa, clearing the way for her to be canonized as Saint Teresa of Calcutta on 4 September 2016. Mark lived at the time of Jesus. Although he was not one of the twelve apostles of Jesus, he was a cousin of St. Barnabas, an apostle. Mark is called an evangelist because he wrote one of the four Gospels. Mark's Gospel is short, but it gives many little details that are not in the other Gospels. While still young, Mark went with the two great saints, Paul and Barnabas, as missionaries to bring the teachings of Jesus to Cyprus and other new lands. Before the journey was over, though, Mark had an argument with St. Paul and immediately returned to Jerusalem. Paul and Mark later made peace with each other. In fact, Paul wrote from prison in Rome that Mark came to cheer and help him. Mark also became a beloved disciple and was like a son to St. Peter, the first pope. St. Mark was made a bishop and sent to Alexandria, Egypt. There many people who heard him preach became Christians. He worked hard to spread love for Jesus and his Church and founded the first famous Christian school in Alexandria. He went through long and painful sufferings before he died a martyr for his faith. St. Mark's relics were brought to Venice, Italy. He is the patron saint of that famous city. People go to the beautiful basilica of St. Mark to honour him and to pray to him. Benedict was born in the year 480. He belonged to a noble family of Rome. In Subico, a town near Rome, he lived in a cave in the side of a cliff for three years. Sometimes a raven brought him food. Men began flocking to Benedict. Soon more than one hundred and forty monks were living with him in a monastery at Subico. They were busy every day praying, clearing the land, planting crops, teaching school, feeding the poor. Their motto was 'Pray and work'. Benedict and his monks built a large monastery on Monte Cassino, on the top of the mountain. Thousands of monks went to that monastery. They were called Benedictines. Benedict had the power of miracles. Once he raised a dead boy to life. 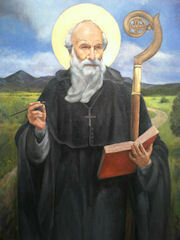 He had a twin sister, named Scholastica, who became a nun and a great saint. She founded the Benedictine Sisters. Benedict died near the altar where he received the Blessed Sacrament, while his monks held up his arms in prayer. One night when the people of Siena were out on the streets celebrating. The little baby Jesus and his mother Mary appeared to Catherine who was praying alone in her room. Mary took Catherine's hand and the infant Jesus put a ring on the saint's finger and she became his bride. Matthew, called Levi, was the son of Alphaeus. He lived at Capharnaum on Lake Genesareth. 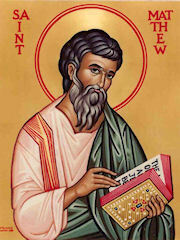 The first Gospel was written by Matthew in which he speaks of his call to be an Apostle. Sitting at his desk one day, he saw Christ come to him. When the Lord said to him, "Follow Me," he at once left his work and followed the Master. The people were surprised to see a Roman tax collector become one of the special friends and disciples of Jesus. Matthew also tells us of the banquet he gave that Christ attended. It was a public farewell to his former friends. Many publicans and sinners came and sat down with Jesus and His disciples. Jesus said, "I have come not to call the just, but sinners." Matthew wrote his Gospel to convince the Jews that the Messiah had come. He preached the Gospel among the Hebrews for fifteen years. 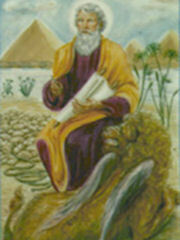 He is also called the Apostle of Ethiopia. His shrine is at Salerno in Southern Italy. 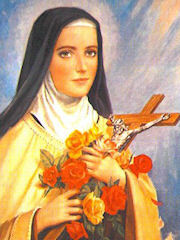 St. Theresa, who was often called the Little Flower, was born in Normandy in France. She had four older sisters and her parents were Louis and Zelie Martin. Theresa was a very lively, lovable little girl and her father called her his 'little queen'. In winter she suffered from the bitter cold and dampness of her plain bedroom. There were other kinds of sufferings, too. Whenever she was made fun of or insulted, she would offer her pain to her beloved Jesus. She would hide her hurts under a smile. She told Jesus to do with her whatever was his will. The young nun wanted to find a 'short cut' to take her quickly to heaven. So she looked in the Bible, and found the words, "Whoever is a little one, come to me." When she lay dying, she could say: "I have never given the good God anything but love, and it is with love that he will repay. After my death, I will let fall a shower of roses. I will spend my heaven doing good on earth." The Little Flower died on September 30, 1897. "O Jesus, my love, my vocation, at last I have found it. My vocation is love!" Joan was born in France in 1412. She helped her brothers on the farm and often went to a nearby chapel to pray to Jesus. When she was seventeen, Joan heard the voice of God calling her to drive the enemies of France from the land. Going to the king, whose army had been defeated, she asked for a small army. 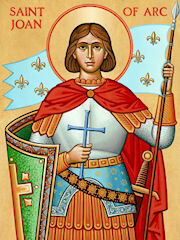 The king, believing that God had sent her to save France, gave her a band of brave soldiers. Joan had a great love for Jesus whom she often received in Holy Communion. She also had a devotion to the angels, especially St. Michael. Joan went before the soldiers carrying her banner with the words 'Jesus, Mary'. The soldiers became filled with courage and drove the British army into retreat. Charles VII was crowned king of France. Later, Joan fell into the hands of the British and remained in chains for nine months. Then she was taken to the marketplace of Rouen and burned to death. With her eyes on a crucifix, she cried "Jesus, Jesus," through the flames. St. Luke was born in Antioch. He was a gentile doctor who was a good and kind man. He heard about Jesus from the great apostle Paul and soon became a Christian. The Bible calls Luke 'the beloved physician'. After becoming a Christian, he went everywhere with St. Paul. Luke was a great help to him in spreading the faith in Greece and Rome. He was with Paul when he was shipwrecked and through other dangers as they travelled from place to place. 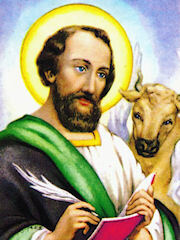 St. Luke wrote two books in the Bible: the Gospel of Luke and the Acts of the Apostles. Although he did not meet Jesus while he was on this earth, he wanted people to know and love Jesus like he did. So he talked to people who knew Jesus. He wrote down all that they had seen Jesus do and heard Jesus say. Saint Luke spent time with Mother Mary learning all he could about Jesus from her. From Mary he heard about how the angel Gabriel appeared to her at the Annunciation. He also heard all about the birth of Jesus in Bethlehem. Luke also wrote the story of how the apostles began to teach and spread the good news after Jesus went back to heaven. It is in Luke's book, The Acts of the Apostles that we learn how the Church began to grow and spread. St. Luke is the patron saint of doctors. We believe he died in Greece. He is one of the four evangelists, or Gospel writers. Bernadette's parents were very poor. They lived near Lourdes, in France. One day, in 1858, while Bernadette was gathering firewood, a beautiful Lady stood in a cave before her. She was dressed in blue and white, and there were roses at her feet. She smiled at Bernadette and asked her to say the rosary with her. Bernadette saw the Lady eighteen times. Once the Lady said, "I do not promise to make you happy in this world, but in heaven." Large crowds followed Bernadette to the grotto to say the rosary with her. They could not see the Lady. The Lady asked Bernadette to scrape the earth. The miraculous spring of Lourdes started to flow. Many people have been cured from this water. When Bernadette asked the Lady her name, the Lady looked up to heaven and said, "I am the Immaculate Conception." Her message was "Pray for sinners." She asked that a chapel be built near the grotto. Today this spot is a great shrine of the Blessed Virgin Mary. Later, Bernadette became a nun. Her life was one of joy. She died, at the age of thirty-six. Then when he took his vows to become a priest he added 'Mary' to his name. Father Maximilian Mary knew that the world which was so full of sin, needed their Heavenly Mother to guide and protect them. He started a magazine called 'The Knight of the Immaculata' so that more people would know about Mother Mary. 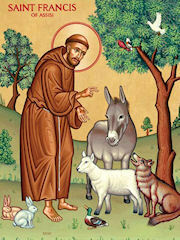 He and his Franciscan priests published two monthly newsletters that were sent to people around the world. 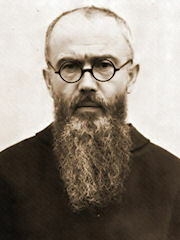 The Mother of God blessed Father Maximilian's work. He built a large centre in Poland. This centre was called 'City of the Immaculate'.